Here before us to enjoy are an original Z1A and a period Z1B with contemporary upgrades. Both are regularly ridden and the owner really doesn’t get miffed if they get dirty. In fact just after our shoot the Z1A went all the way to Scotland via the Lake District and got truly mucky. Owner Graham Peters is emphatically of the ‘ridden not hidden’ mindset. As we get to our statics location and play arrange-the-motorcycles for Gary the Lens, another persistent impediment to testing classic motorcycles appears. Two guys in a massive removals lorry pull up just yards from a tight bend to exclaim: “Wow, Kawasaki Z1s, you don’t see many of them do you?” Pleasantries exchanged and potential CMM readers satiated, we can get back to the serious business of lounging around enjoying the view of two 903cc classics basking in the sun. There can be absolutely no denying that the lines of any Z1 are inarguably bang-on. 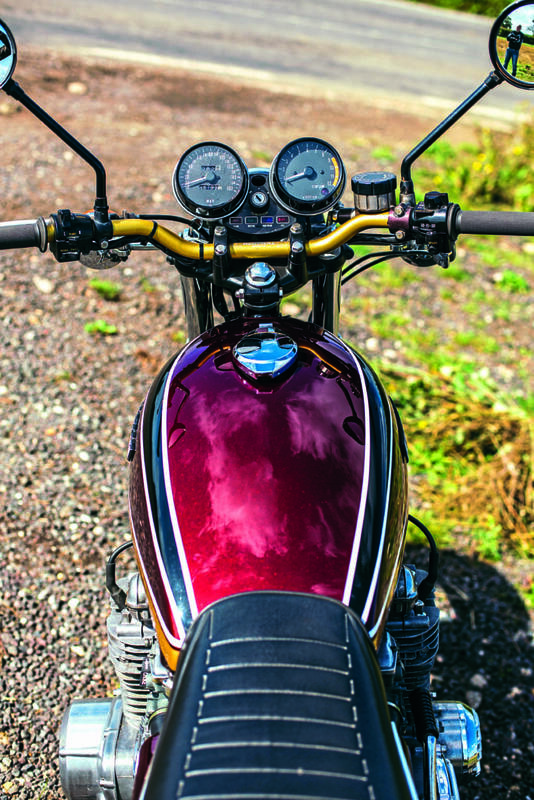 Those acres of chrome are from another time when luxuriant plating wasn’t the bastion of custom bikes alone. 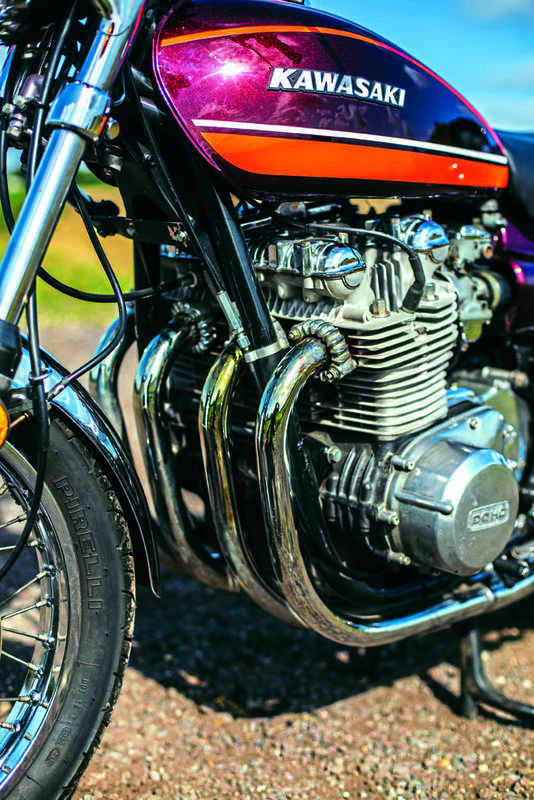 There’s a lot of it on a Z1 but arguably it’s those four silencers that delineate the machines from their most obvious commercial rival, the Honda CB750/4. Getting each pair of outlets to line up vertically was a master stroke of styling (and pipe bending); it’s a look few have dared to emulate. Throughout the early to mid-1970s Japanese bike designers were struggling to find a long term identity or profile for their machines. Honda’s stylists gave it a fair go but ultimately the 750 does look somewhat disparate from certain angles; the Z1 series, though, are entirely different. The way the tank flows into the seat which then melds into the tail piece was a master stroke of styling. Ditto the side-panels that wrap around the outer air-box rubbers and fill the gap beneath the seat and up to the fuel tank. This was arguably the first time so much conscious thought had gone into a Japanese motorcycle’s looks. Even when parked up the bikes screamed speed; there really was no need to style those gauges with those rakishly angled lower covers yet they did and it simply adds even more dynamism to a bike that’s not even moving. Normally you’d not expect there to be much difference between two model years. However, as is obvious by the pictures, the Z1A is factory brochure correct while the Z1B is a little modified yet nothing that cannot be returned to standard if so desired. No doubt the rivet counters will have noticed the Z1A has black cases yet there’s no need to rattle a letter off to the editor just yet. As an early example of a Z1A our specimen is, in effect, a transitional model made early on to use up the ‘old’ Z1 cases. Pleasing to see Kawasaki were as parsimonious to throwing away perfectly good parts as their rivals! So with all of that established there are going to be some obvious cosmetic difference between the two bikes but it’ll be interesting to see if there are any substantial divergences in the actual ride qualities. Amazingly my notes and recollections suggest I’ve never actually ridden a Z1 which I find kind of odd. Z900 A4, yes, done that one, and Z1000 as well but although I’ve passengered on a Z1 I’ve never been at the sharp-end so to speak. The standard Z1A fires up on the button courtesy of Dyna coils and ignition, well everyone fitted decent sparking systems to them back in the day so why not now? 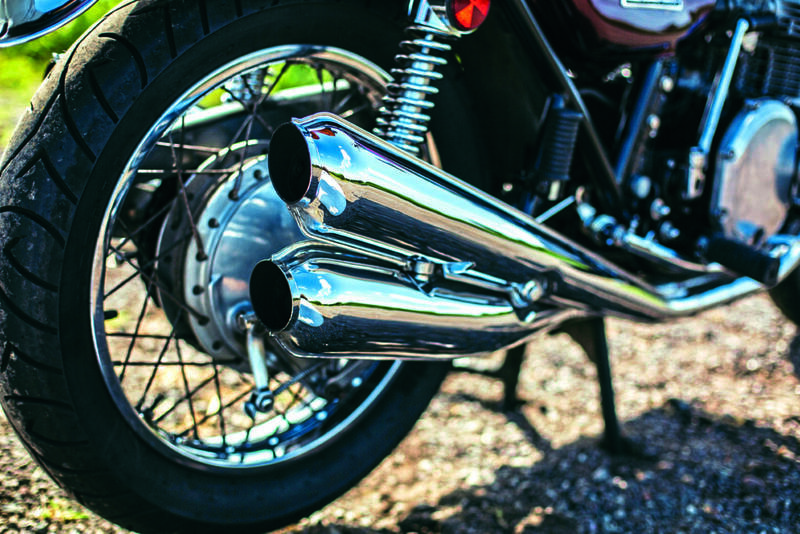 Those iconic exhausts emit a delicious note that Honda 750/4 owners surely dream about and that’s only at tickover. Into gear and under way the first thing you notice about the mighty Zed is the torque which comes in early and in large dollops. That additional 167ccs of capacity makes a substantial difference to the way the motor gets moving. For most mortals back in the day, the experiences offered by bikes such as this were at the periphery of their ken and sometimes more than a little beyond it. 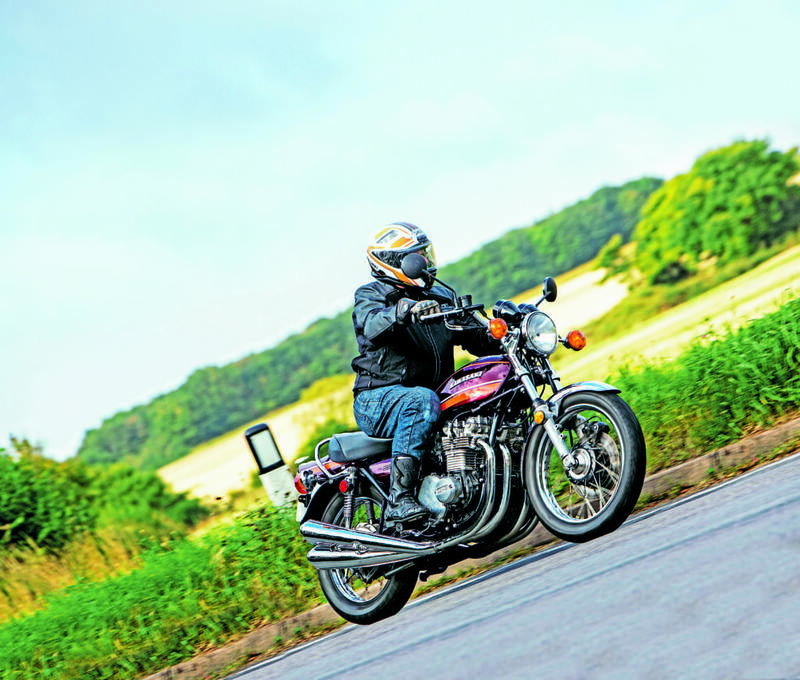 The Z1 and all of its analogues was the ultimate riding encounter for the average enthusiast. Now four decades on the Z1 experience is almost an average one in terms of performance. To put that into perspective, Yamaha’s current MT-07, 689cc, parallel twin, choked by a catalytic converter offers nigh on comparable speed and acceleration… but that’s progress for you. 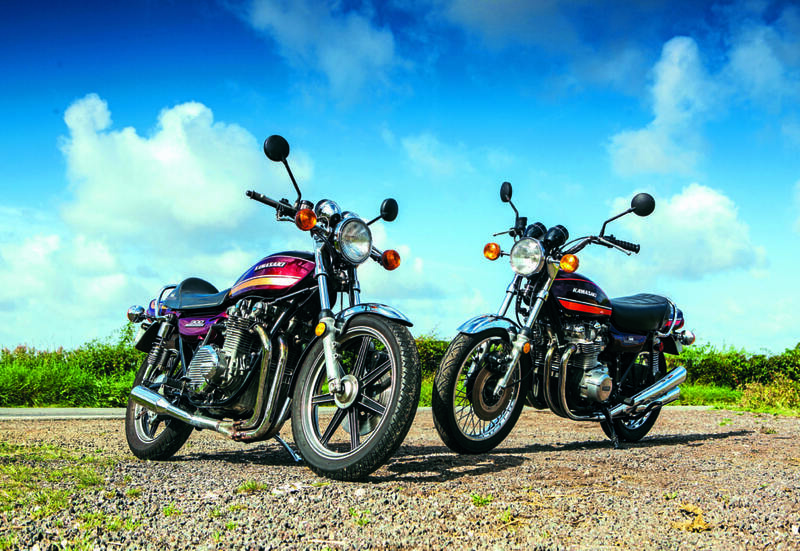 Neither the Z1 nor the Yamaha will actually pull your arms out of their sockets yet the older bike is hugely more demanding and arguably much more exiting. Despite what some might tell you the Z1 and its siblings does not handle with unqualified aplomb. Kawasaki blew the budget on the engine so the chassis and its appendages were only ever adequate at best. Steering lock is restricted which is partially an artefact of the steering damper. Some would even argue the presence of the hydraulic unit was tacit admittance by the manufacturer that the company knew the bike was substantially less than ideal in the handling stakes. The bike tracks fine in a straight line and that sublime motor eggs you on to go ever faster; this was one of the bike’s biggest attractions. Where it all gets a little flaky is when you ask the bike to rattle through a series of bends. As we all know and understand, the frame is adequate at best and made to a budget, which leads to flexing when pushed beyond a certain point. This, allied to typically over-sprung and underdamped suspension, means that when the forks and shocks are pushed beyond their abilities and telegraph their inadequacies back to the frame, things start to get a little lively. But before you read that as a damning criticism of the mighty Zed remember that all Japanese machines of the period were exactly the same or even worse. Compared to a 500 Mach III, the Z1 was a veritable paragon! Ridden with a modicum of restraint the bike is a huge delight and even if the USA-spec bars hang me out like a spinnaker I can’t help giving it large. My technique becomes rapidly modified once I know I’m not going to be contemptuously spat off into a ditch. Barrel it though the gentler curves and don’t shut off completely; this keeps the bike relatively taut. Come the bigger bends, scrub off as many em-pee-aitches as seems appropriate then wind open the taps on the other side; the bike seems to approve of this technique. To carry on reading, you can purchase the March 2018 edition for the whole feature with plenty more expert knowledge and more pictures! Just click here! Previous Post:Show Us Yours: Nick’s collection!